What is a 200 thickness? A 200 thickness is 2 thousands of an inch (2/1000 inches), equivalent to 50.80 microns and to 0.0508 millimeters. The thickness of the bag that is usually bought in supermarkets for domestic use is 200. What is a 400 thickness? A 400 thickness is 4 thousands of an inch (4/1000 inches), equivalent to 101.60 microns and to 0.1016 millimeters. These bags are recommended for heavy-duty use since they have twice the thickness of the standard bags. What is a 600 thickness? A 600 thickness is 6 thousands of an inch (6/1000 inches), equivalent to 152.40 microns and 0.1524 millimeters. These bags are recommended for heavy-duty use. 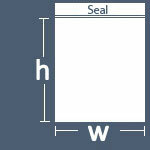 The w always refers to the width of the bag, while the h refers to the height of the bag, this being the measurement between the base of the bag and the seal. (does not include the upper flap at the seal). In other words, the dimensions are approximately the same as the interior dimensions. For example, in a 3"x 4" bag a 3"x 4" piece of paper would fit. What variations does the bag have? Width + / - 1 / 2 inches. Height + / - 1 / 2 inches. How can I use these bags? You can use them to file important documents, to protect jewelry, toys, food, electronic pieces, among others.